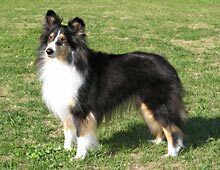 Merling is a color pattern in which the black hairs of a Sheltie are diluted to gray in irregular patches. 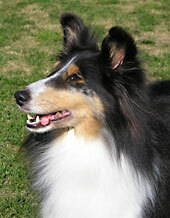 Blue merle occurs when a genetically tricolor or bi-black Sheltie also carries a merle gene. 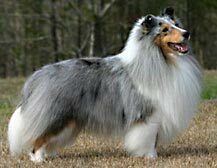 Therefore, blue merle Shelties occur with and without tan points, and both variations are equally acceptable. 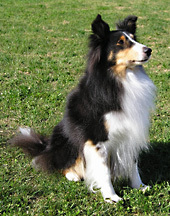 Like other color Shelties, blue merles and bi-color blues (bi-blues) have varying amounts of white markings. Blue merle Shelties are permitted to have blue or merled eyes. The merle pattern can also be superimposed on the black hairs of a sable to produce sable merles. However, blue or merled eyes are a fault in a sable merle. 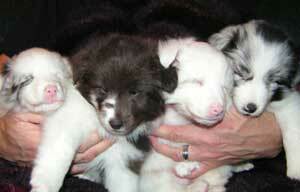 In general, when breeders refer to a Sheltie as a blue merle, they mean a dog who is blue merle, tan and white. The term bi-blue refers to a blue merle and white dog who lacks the tan points. Breeding Caution: If two merles are bred together, there is a one in four chance of producing a homozygous, or double, merle. Double merles generally have defective hearing, defective vision, or both. 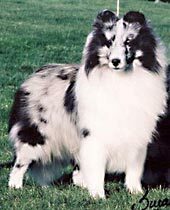 The merle pattern can be superimposed on the black hairs of sable, tricolor and bi-black dogs to produce sable merles, blue merles and bi-blues. Normal blue merles are all heterozygous, carrying one merle gene. If two merles are bred together, one in four puppies can be expected to be homozygous, or double, merles. Double merles generally have defective hearing, defective vision, or both. See the color inheritance page for more information. Now You See It, Now You Don't – Cryptic Blues: A crytic blue merle is one who at first glance appears to be a tricolor or bi-color black. Close inspection reveals a small amount of merling somewhere on the body. The dogs are genetically merles, and reproduce merle offspring like any other merle. They do not seem more likely to produce cryptic merle offspring than other merles. Is she or isn't she? This girl appears to be a tricolor. But a closer look shows that she isn't what she seems. There is a merle patch on the front of her right front leg, and another below her left eye. Double Merles: Double merles are usually, but not always, predominantly white. They typically lack color on their faces and ears. The two white puppies in this litter are double merles. The black puppy is a cryptic blue. The fourth is a bicolor blue merle. Although the odds of getting a double merle when breeding two blue merles (or bi-blues) together are one in four, there is no guarantee of getting that in any particular litter. Remember that double merles usually have hearing and/or vision defects.